A year after his girlfriend is brutally murdered, a young man wakes up with devil horns. The man is Daniel Radcliffe, star of Horns, the movie based on the bestselling book by Joe Hill. This new trailer reveals more of the movie's bizarre premise, as well as Radcliffe's strange powers. 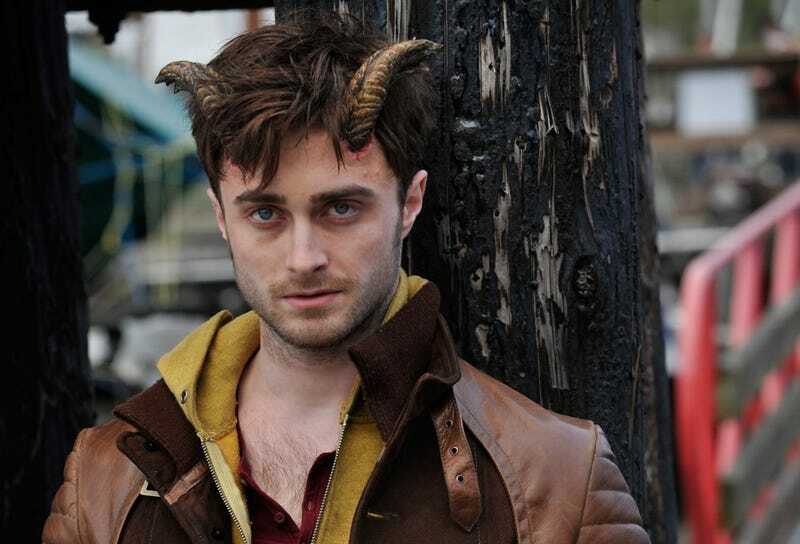 I only recently read Horns for the first time, and while it wasn't necessarily brilliant, I ended up being completely captivated by it — and now it's one of the movies I'm most looking forward to. I'm also really impressed by the brilliant casting of Radcliffe as Ig; in the book, Ig begins as innocent and good-hearted as Harry Potter, but all that changes when his girlfriend is murdered and his life goes to hell (no pun). Casting Radcliffe conveys that sense of a good guy who has been totally overwhelmed by the evils of the world, and has given up perfectly. Horns opens on October 31st — I'm really, really looking forward to it.